Do any of you have experience yet with the most recently released Lionel American Flyer 2-8-4 Berkshires. I believe they have 6-4402X product numbers depending on the railroad they're painted in (0=NKP, 4=Erie, etc.). How well do they 1) operate - motor control, smoke, sound, run forward and reverse, etc. 2) any issues/failures, 3) work and/or look compared to earlier release Berks, 4) what's the Bluetooth app like? Thanks. One other questions - does it matter whether a Flyer Chief engine such as these is put on tracks that have a TMCC or Legacy Command base connected to the rails and powered up as well as a transformer? Are FC engine oblivious to the presence of a Command base (i.e. don't detect it or care as long as there is either AC or DC going to the tracks - 18V if in Remote mode, variable if not)? Or can the presence of a Command base interfere with proper FC operation? 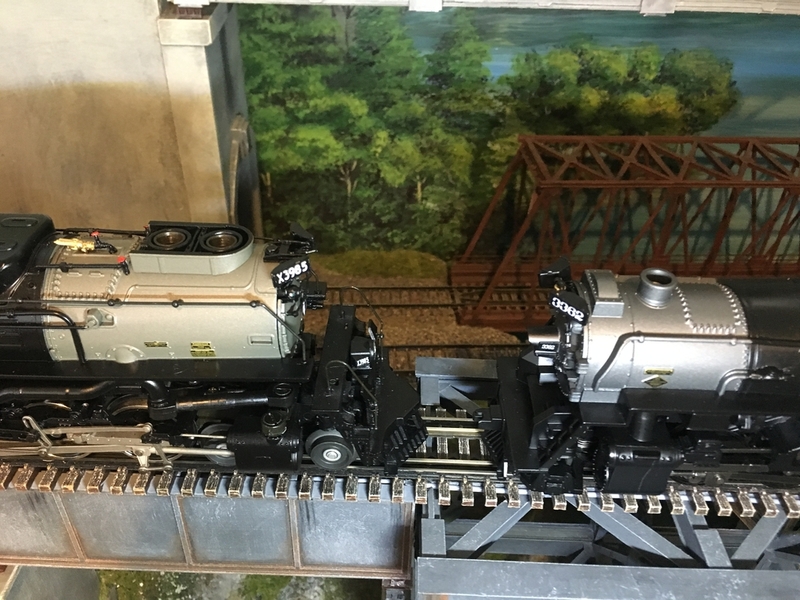 I run mine on the NPS DCC layout with no problems or issues until the last meet. Apparently the sound board was fried, but another DCC engine had the same problem, so it could have been a layout problem. I have the Erie Berkshire. It runs and smokes well. I ran it on my Legacy layout, FlyerChief ignores the Legacy signal. 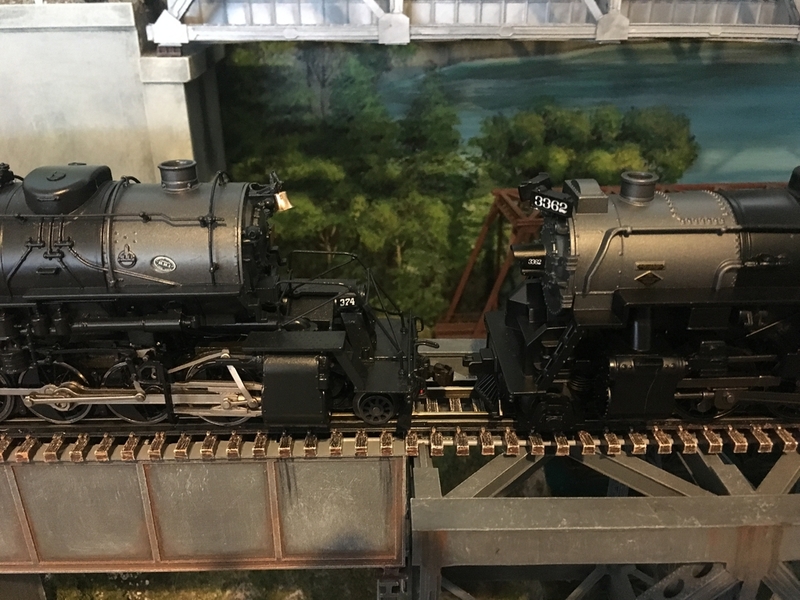 When Lionel cancelled the Legacy version of the Berkshire I sent mine to Carl Tuveson to have it converted to TMCC/Railsounds. It is now a much better engine to run on the layout. Carl has a video of it on his website, tuveson.com. The engine in the video is Carl’s. Mine is an Erie but otherwise identical. Agree, it is awesome! Carl also just did a similar conversion of my FlyerChief NYC Northern. It should be back at the house when I return from my current business trip on Friday. I cannot wait to try it out. Mine was the first Northern he did so I do not think he posted a video of it yet. Here is Tom's Northern. I did not get a video of it. Here is a web page of the conversion. Thanks everyone. No doubt Carl does incredible work. While I was actively converting engines to TMCC and DCC for customers and my own purposes, I regarded Carl as the Yoda of TMCC conversions (still do), Ed Goldin as Obi-Wan Kenobi (still also a master), and myself at best Luke in training. I started with a pair of L/AF GP's in 2007 and went on from there. In fact, one of the four engines that I'm hanging onto is an S-Helper 2-8-0 that I converted to TMCC with sounds and synched puff 'n chuff also in 2007 with much input and advice from Carl who boldly paved the way with that one (tight squeeze, tiny tender, etc.). Click here for a video of that Connie in action. I apologize for the low-res. I should make an updated video. I've recently sold the rest of my conversions, but am very glad to see that Carl and Ed are continuing to advance the craft and the "force" that is with them. However, I/we digress, back to the subject at hand - the latest release of L/AF FC Berks. Are the white running boards, and white driver rims new to the 6-4402X series of Berks (with Bluetooth) or did earlier versions of AF Berks also have those white accents? Do you have any other observations/comparisons with regard to early and late release (unconverted) L/AF Berks? One other question, how many versions or releases of L/AF Berks (including Polar Express Berks) have there been and when? I'm not certain but I think this is the most recently released 6-44021 NKP #759 from 2017-18. And this, the previous NKP #765 6-42562 from 2016? Mine is currently in the shop, but I believe that each Berk is different according the the road. Apparently a short on the NPS layout took out a DCC engine and my sound on my C & O Berk. We're constantly upgrading and perfecting the layout, so glitches are to be expected. Sorry to hear about your two engines laid up. I hope they're back on track and running like lightning very soon. I think you might be onto something re: stripes on some Berks, not on others depending on RR. Maybe to the extent in fact that the earlier and latter Berks are opposites of each other -- if it got stripes in the early release, it won't have them in the latter, and vice versa. The exception to that being the "whitewall" drivers. Those I think are only on latter Berks. Hard to tell, but at the next show or two I will pay more attention to what Berks get brought to run and see. Clubs and individuals are definitely zealously integrating and co-mingling every op sys du jour they can. Some club layouts are now to the point of "proceed at your own risk". I had a couple of TMCC engines get their "brains" scrambled on one a couple of years ago. Hard software resets straightened them out, but I might actually start taking my RRampmeter to first confirm exactly what (power) is on the tracks before I put something on them. It reminds me of myself the past 10-13 years as a major multi-system advocate who "had" to be able to switch between AC conventionally controlled by a Cab, TMCC, Legacy, LocoMatic (10-button boxes), DCC, and DC on my layout or I felt it came up short. Now its Legacy, DCS, Bluetooth LionChief, Wifi, and FlyerChief instead. But then too I had dozens of engines and hundreds of cars. Funny, now that I'm down to one TMCC engine with a Cab1, three conventional engines with a 30B, maybe a FlyerChief/LionChief Berk, and 20 cars I don't miss all of that piling on and complexity. Sometime less is more. I feel liberated, definitely more relaxed about the hobby, and enjoying things like club events more like I used to -- 10-13 years ago. Glad I pared down. What goes around comes around I suppose. Thanks again for your reply. Good luck with your engines and have fun running your trains no matter how many, simplified, or complicated. The cosmetics seem to be different by road name. 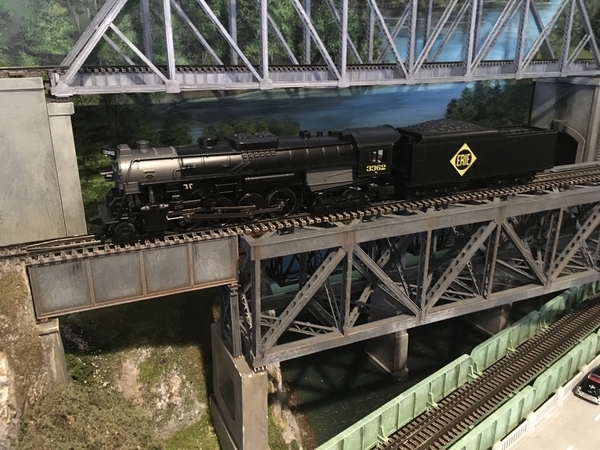 Here is a picture of my Erie Berkshire on the layout. The tires are blackened rather than shiny. It wasn't two of my engines, it was my Flyerchief C & O Berk and another members' DCC engine. Our tech team thinks they may know the problem, can't have a continuous loop wiring (causes surges). Changes are being implemented on the layout to prevent further problems. Thanks, especially for the photo. That would be great if Lionel mixed and matched several treatments - driver hub color, rim color, stripes or not, etc. Even better if those are based on actual 1:1 Berk differences by RR, but I'll leave that for others to validate/debunk. It makes sense for Lionel to do that rather than just re-mint the 2016's with only some internal electronic changes to accommodate Bluetooth/LionChief. 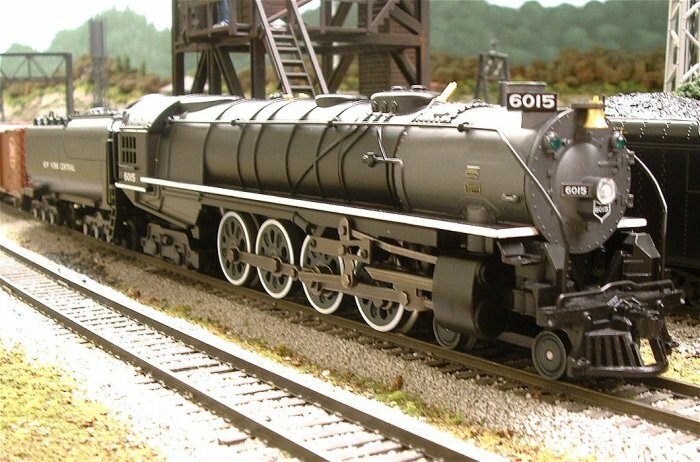 One other thing I noticed is that it seems the smoke box paint on recent Berks is lighter and more silver than gray as used on earlier Berks, but lighting, etc, can make photos misleading. Thanks for the clarification. Sorry for my misunderstanding. One thing I recommend as soon as engines with electronics in them get used is installing fast-acting spike (spark) and short protection everywhere on that layout. That's even true without a command system in play, just electronic reverse units is reason enough. I used to recommend Scott's Odds 'n Ends DTK-4Z's for spike protection and a bank of 7A fast-blow fuses for short circuit protection. I used them on my layout and that combination saved the day -- never an electronics failure even with personal and club event TMCC, Legacy, and DCC use. However, SOE is out of business and there's (finally) something fast-acting (critical), resettable, and better that FA fuses -- DCC Specialities PSX-AC units. Two were installed on one of the club layouts that I run on and they are great. You and NPS might want to consider them. Could prevent burn-outs and other electronics harm. Just didn't want you to think that I suffered some crippling loss. I am also going to check the gauge on all the wheels when it comes back. I've heard that stuff is coming through out of gauge. OK. Thanks for the tip. I heard offline from a new Berk owner that initially his had metal projecting out from the engine chassis that made contact with the inner surface of the left rear driver rim causing sparks, arching marks on the rim, and sporadic performance (as you can imagine). He got it replaced under warranty and has been happy since.